Construction is under way on a 25,000-sq.-ft. operation in Florence, Ind., to become the new flagship of precast trench, box and vault specialist Trenwa Inc.. 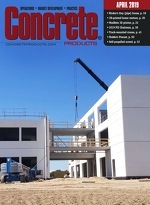 In 2011, the producer will relocate its Warsaw, Ky., headquarters production to the new facility, equipped with an Advanced Concrete Technologies SmartMix batch plant and Crane-Tec overhead handling equipment. The plant is rising on 10 acres in the Markland Business Park. A Switzerland County Economic Development Corp.-envisioned completely serviced, shovel-ready, immediately available site, the park lies along the Ohio River and harbors the northern approach to the Markland Bridge, linking Indiana and Kentucky.